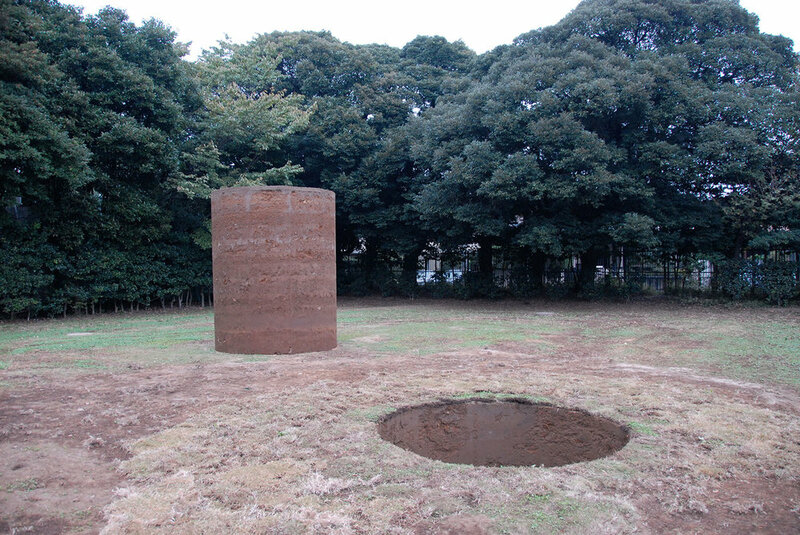 Nobuo Sekine, Phase—Mother Earth, 1968 / 2008, Earth, cement, Cylinder: 220 x 270 (diameter) cm, Hole: 220 x 270 (diameter) cm, Installation view, Tama Line Art Project, Den-en Chōfu Seseragi Park, Tokyo, November 1 - 9, 2008. Photo: Ashley Rawlings. The earth’s surface is yielding; things can sink through and permeate it. It can be sculpted, divided and redistributed at our will. Humans make a habit of digging below, to bury, discover, examine, or extract. We disrupt layers of stratum that record the earth’s time and generation. In 1968, Nobuo Sekine began to dig a deep hole at Suma Rikyū Park in Japan. The upturned matter was fortified with cement, and compacted into a cylindrical mould. After a week of curing, Sekine loosened the mould’s binds to reveal a monolith of compressed soil. Phase—Mother Earth marked the beginning of the Mono-ha movement, through which artists facilitated sensitive encounters between objects and site. Sekine’s temporal interventions draw attention to things as they are, harnessing the potential of ‘not making’. Akin to the process of digging, his practice responds to the physicality of matter at hand, turning it over until its inherent poetics are revealed. Bernadette Klavins is an emerging artist and writer in Adelaide, South Australia.